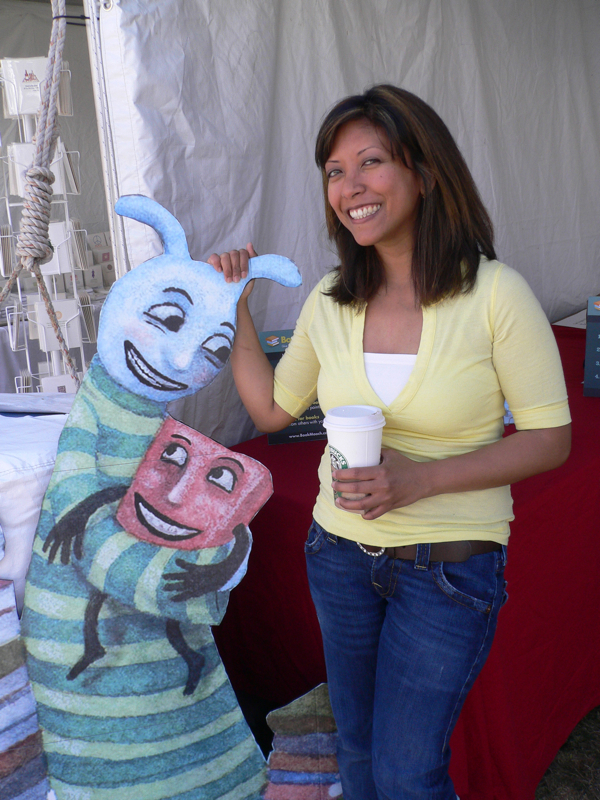 I wanted to report in on the LA Times Festival of Books – wonderful event. 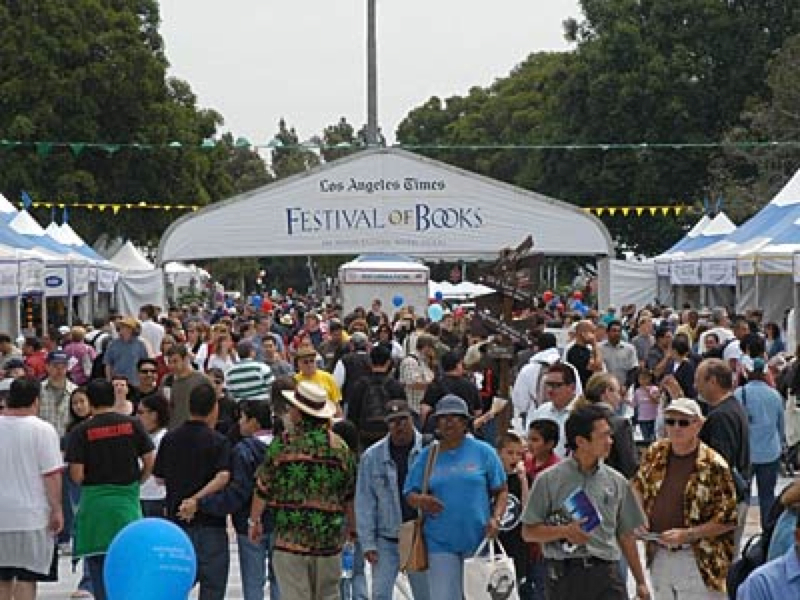 As one of the larger book festivals turnout was very healthy — organizers estimated about 170,000 attended. 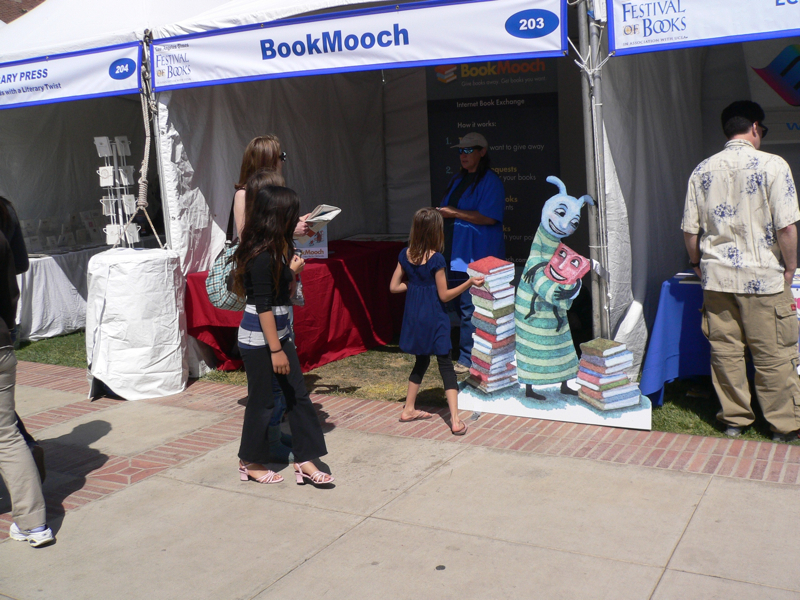 The BookMooch booth enjoyed a constant stream of visitors who expressed interest & appreciation. Folks understood the concept right away and were very enthusiastic. Most overhead comment was “Great idea, I will definitely join!”. 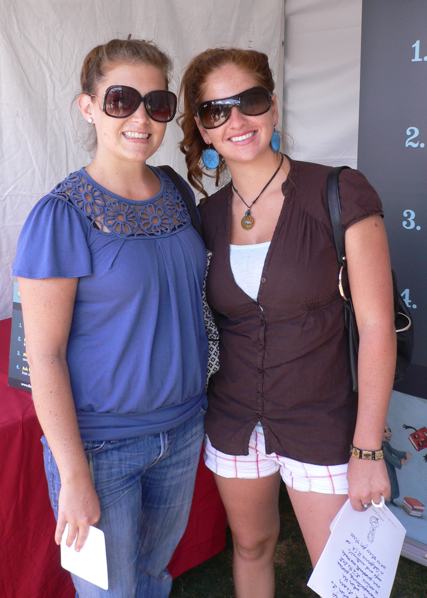 BookMoochers Margot and Veronica came to help out with the booth. Several other Moochers stopped by specially to say hello and thanks. 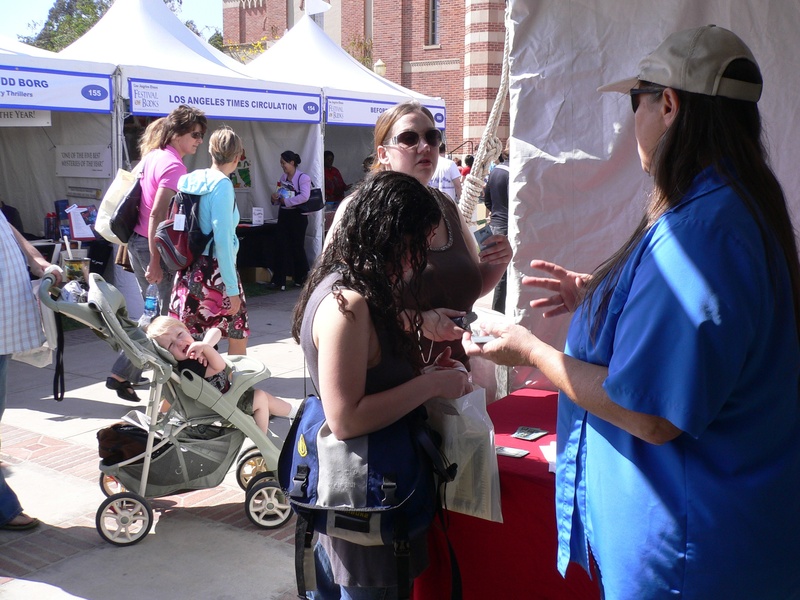 The Festival was on the beautiful UCLA campus and I’ve attached some shots in a zip file if you want to post them on the blog. 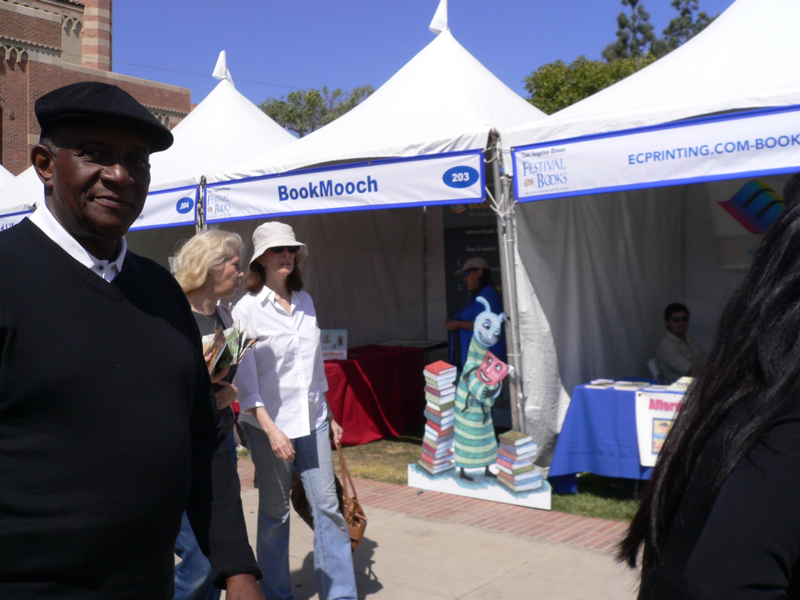 BookMooch will be exhibiting at the LA Times Festival of Books on Saturday, April 25 and Sunday April 26, 2009 in Los Angeles, California. 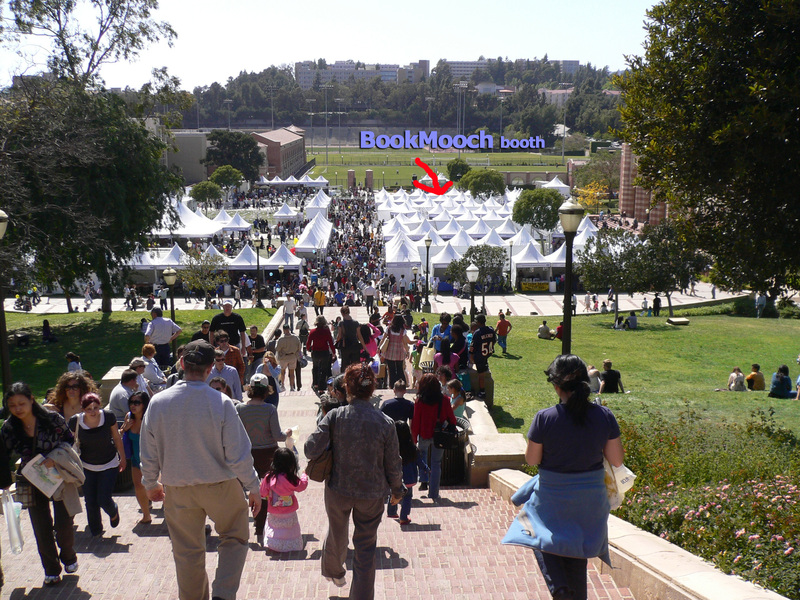 BookMooch had a technical problem for 10 hours, from about 5pm Pacific time to 3am Pacific time, and the web site was giving an error message in response to most things. Everything should be back to normal now, but if you have any problems please do contact a tech support volunteer. 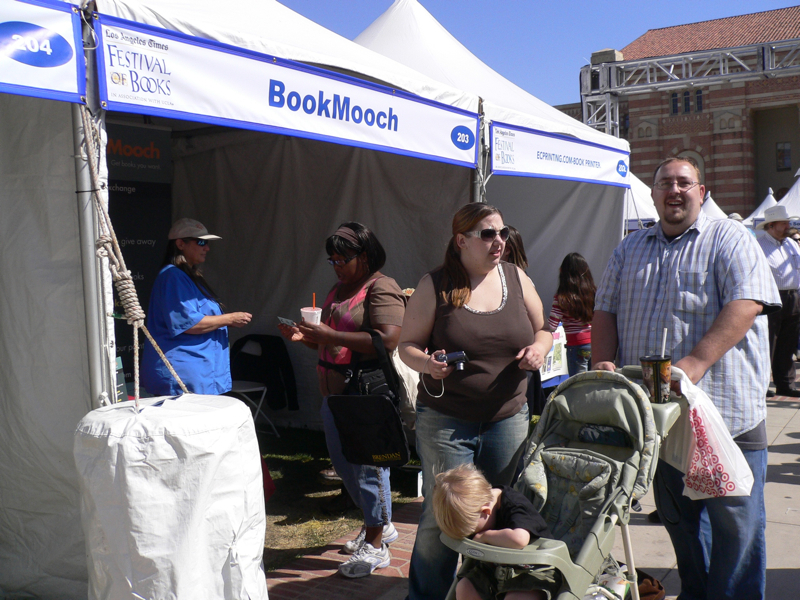 A new version of the BookMooch software went up today. There are a lot of tiny things changed in it. Most people won’t find the list below very interesting, but the detail-maniacs (like myself) prefer to have everything nicely documented. I’m working pretty heavily on BM at the moment, going through all the little bugs and annoyances first. After those are done, highest on my list is redoing the reservation system to hide reserved books (and not send email notifications) and to put up a new forum system. I received a report that IE8 didn’t work with BM. The user sent me a screen picture where the text entry fields on a form were really tiny. I installed IE8 and had no problem with BM. If you have problems with IE8 and BM, please email me and tell me how you caused the problem. The recommendations feature tended to recommended the same 50 or so books over and over, which are the best-sellers that everyone has read (that’s why they get recommended). I decided to automatically remove books that were over-recommended, which for the time being I defined as recommended for more than 20,000 titles at BM. Hopefully, that will help the recommendations be more interesting. The admins, and also Australians and Singaporeans have noted that sometimes books take as long as 6 months via boat from a foreign country. So now, you have to wait 4 months (it was 3) to mark a book as lost from a foreign country. For the same country, this has been lengthened to 6 weeks (from 4) for the same reason. I get a lot of emails complaining about accounts on BM where the user hasn’t logged in a while, and the person wants me to remove them. The way I prefer old accounts to be removed is for you to mooch a book from them, and if they don’t respond to the mooch for 10 days, if you cancel and indicate they didn’t respond, the person’s account is automatically put on vacation. This avoids the case where someone hasn’t logged into BM because nobody has mooched their books in a while, and seems fairer. The change I’ve just made simply has a link from “possibly inactive” in their bio to a page explaining how you can help. The admins have noted that some people add way too many dupe copies of the same book. There isn’t demand for that many copies, and also it’s not fair that they get 1/10th of a point for each copy. From now on, you will be limited to 3 dupe copies by default. If you want more (such as if you’re giving away mooch cards) you can email the admins (a link is provided) and they can increase your limit. If an admin is looking at somebody’s account, and that person can’t use BM while this happens, this is now indicated on their bio page. This doesn’t mean they’ve done anything wrong, but “temporarily on hold” is a precaution while the account is reviewed by a volunteer admin. most bindings at Amazon like “Clothes” or “Electronics” are now stopped from being added to BM. About 5% of the catalog at BM has non-book stuff like this. However, most of the non-book stuff are audio-books, which I do want to allow, and audio books are still allowed. I’m working on something that will remove the non-books from the database. for programmers: the XML database feed of books was really large, due to the recommendations field being included. That field is no longer included, resulting in a 80% size decrease in the XML feed.